Summer Sunday school is fun and relaxed with popsicles for snack and air conditioning for hot days! There’s one multi age group. We’ll continue to use the Shine curriculum. There’s a calendar of what stories we’ll be doing on the table in the narthex. Not sure what her “something” could be, Miss Rumphius plants lupine next to her seaside cottage and notices that the following year, its seeds have traveled to the headland on the opposite side of the inlet. And thus her “something” is born: she will spread these beautiful flowers up and down the coast, as far as the eye can see. 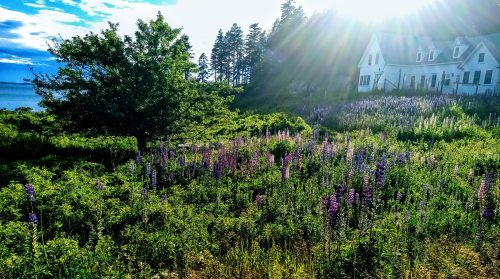 We came to Maine at the height of lupine season, and I have to say I’m smitten. Every turn in the road presents another glorious composition of purples, pinks, and whites showing off with a humble groundedness – lupine is, after all, a cousin of the homely pea – that seems entirely in character with one of Maine’s other gems: its hard-working, unassuming people who yet have a bone-deep appreciation for the natural beauty surrounding them. I can’t help but be reminded of the Parable of the Sower found in Mark 4:3-9, wherein a sower not unlike Hilda scatters seeds with abandon, apparently paying little attention to whether his seeds land on arable ground. His actions seem wasteful, particularly in a pre-industrial context where seeds were painstakingly harvested by hand. Nevertheless, some seed succeeds in falling on “good ground” and sprouts multitudes, yielding results beyond all expectation. As I enter into my second year here at Park Avenue (can you believe it?! ), I’m struck by two things: first, like Miss Rumphius, we are being called by God to do something beautiful in the world. And second, we really can’t predict which of our efforts will take root, or where, or how. The best we can do is to sow enthusiastically, heads out the window like Hilda, and trust God to bless our endeavors – sometimes in unexpected ways. This year I invite you look for ways, both personally and as a part of PACC, to keep sowing beauty and trusting God to turn a few ditches into roadside delights. My hope is that in the years to come, our community will be littered with the glorious results of our enthusiasm, fertilized with God’s surprising goodness. Will you join me? Youth Sunday is June 10! Our theme this year is “Making a Difference”. This comes from our Sunday school lessons this spring about speaking out about injustice and trying to change unfair rules. We’ll only have one rehearsal with everyone on Saturday, June 9, from 9:30am-11:00 am in the sanctuary. Please make every effort to come for at least part of the rehearsal, particularly if you have a speaking part. Younger children and youth without speaking parts can just come for the first 30 minutes so we can run through the music together and everyone can see where they’ll be sitting and what the service will look like. During the rehearsal, we’ll also pot the flowers that we’ll distribute to the congregation at the end of the service. It would be great if a couple of people could help with this. We’ll have the flowers, potting soil and cups all ready. Please let Kate know if you’re available to help. Our last day of regular Sunday school will be on Sunday, June 17. After that, we’ll move into our Sunday school schedule of one multi-age class. Summer Sunday school is fun and relaxed with popsicles for snack and air conditioning for hot days! We’ll continue to use the Shine curriculum for a multi-age group. The CE ministry will provide hot dogs, drinks, and chips. Please bring a side dish or dessert to share. There’s a pool and tennis courts, so bring your bathing suit and towel and/or a tennis racquet and balls if you’d like to play. A small kiddie pool for younger children in swim diapers will be set-up as well. There is plenty of shade to sit in near the pool. Bring a game or puzzle to share if you’d like. There’s also a ball field if anyone would like to organize a softball or whiffle ball game. We hope to see you there! Bring non-perishable food items and household goods to church by Sunday, June 3. Find high-need items here: arlingtonfoodpantry.org/donate-food. You may also donate by check or cash noting that the funds are for AFP. Thanks for your generosity and thanks to Bryan Mau for delivering our items to the AFP. PACC provides a meal for about 25 people on the 4th Monday of every month. June 25 this month. Look for an email to CHAT or speak to Kate Lindheim if you’d like to prepare dinner, provide food, and help set up, plate food, serve food, or clean up. The Poor People’s Campaign will hold rallies at the Massachusetts State House on June 4 and 11, 2:00 pm – 4:00 pm. Talk to Jill Lewis if you’d like to go with her. Sat., June 23, 10:00 am is the “Global Day of Solidarity and Sending Forth Call to Action Mass Rally” in Washington, DC. For more information check out – https://www.macucc.org/engage. The Council of Deacons has named Mike Rich and Betty Gitlin-Rich as PACC’s delegates to Tri-Conference Annual Meeting, June 15 – 16, – Mass Mutual Center, Springfield, MA. You can join us for this exciting event. See https://www.macucc.org/eventdetail/8909660 for more details. Please see https://www.macucc.org/guncontrol , for resources compiled by The Justice and Witness Council of the Massachusetts Conference UCC. We distributed our 2017 Hayes Fund income in May to Dorchester Special Athletes ($600.00) http://dorchesterspecialathletes.weebly.com/ and Greater Boston Legal Services School to Prison Pipeline Intervention Project ($895.00) https://www.gbls.org/our-work/elder-health-disability/school-to-prison-pipeline-intervention-project. Pride Morning Worship is a high-energy, joyous annual service celebrating the LGBTQ community. This year we will honor Freedom for All Massachusetts, the bipartisan coalition committed to defending the Bay State’s existing transgender-inclusive nondiscrimination law at the ballot this November. http://www.bostonpride.org/calendar/ includes links to the above and much more. On Pentecost we shared a solid first draft of Park Avenue’s “Why” statement – the reason we are a part of this faith community and the difference we hope our community makes in the world. This Why statement was drawn from more than eight months of listening to your hopes, dreams, and values. It highlights two things that came up over and over again in our conversations: how important both human and spiritual connection are to you; and your desire to do good – to have a real, positive impact on those around you. The importance of connection grew out of conversations about what’s missing in our world – how fragmented our societies have become, both socially and spiritually. It’s a bold claim about the power of building community and attending to our spiritual lives – and a reminder that that takes practice! It’s a proclamation that when we show up here and give of ourselves and are vulnerable with one another, we are living the way God has created us to be – together, with a sense of belonging, worth, and purpose. The idea of “true neighbors” comes from a coffee hour conversation about the difference we want to make. The invitation from Mr. Rogers (who, you may know, was a minister) to “be my neighbor” got us thinking – how can we be good neighbors, both to people down the street and people across the world? A game-changing answer is found when someone asks Jesus “Who is my neighbor?” He responds with the parable of the Good Samaritan, challenging us to see strangers and even enemies as belonging to us, as worthy of compassion and dignity instead of dismissal or pity – in other words, as just as valuable as our own flesh and blood. That’s another bold proclamation in a political and cultural climate fixated on dividing people and demonizing the “other”! I hope these concepts resonate with you. As with any “Why,” ours is subject to tweaks and adjustments, and in the weeks to come, I hope to hear from you all what you think of this Why statement so that we can refine it together and make it our own. In the meantime – from “Transgender 101” to “Learning to Pray” to the annual church picnic – I am excited for Park Avenue to continue championing connection and neighborliness! May God be with us as we do so. P.S. For further reflection on connection and being neighbors, go to www.pacc-ucc.org/sermons and click on the sermons from March 4 (connection) and May 20 (neighbors), 2018. We are continuing to learn stories about peacemaking. This month we’ll be learning about how Abigail prevented a war (1 Samuel 25:1-35), Elisha turned back the soldiers (2 Kings 6:8-23), the story of the Good Samaritan (Luke 10:25-37) and about respecting others (James 2:1-13). We’ll have one multi-age class on Sunday, May 27, Memorial Day weekend. The middle school youth group meets during the worship service on Sundays. May 13 We’ll be learning about the story of the good Samaritan and making some plans for Youth Sunday (June 10). We’ll also assemble a birthday bag for our dorm at Youth Villages. We collected $1,430.00 for OGHS during Lent. THANK YOU for your generosity. Talk to Mike Rich or Jill Lewis if you would like a copy of the resource list that the Arlington Human Rights Commission and the ADL sent out after the event. The walk will take place Sunday, May 6. Learn more about it here: www.projectbread.org/walk-for-hunger. Talk to Jill Lewis or Kate Lindheim about contributing through the PACC team. Every month we take a birthday party in a bag to our dorm at Youth Villages. Each bag contains 3 boxes of cake mix, 3 containers of frosting, birthday candles, a birthday banner or streamers, coordinating plates and napkins for 20, and a birthday treat (stickers, a bag of lollipops, bubbles, nail polish, an adult coloring book and colored pencils). If you’d like to donate any of these items, you can bring them to church and place them in the blue bucket marked Youth Villages under the table in the narthex at any time. Thank you! Bring non-perishable food items and household goods to church by Sunday, April 8. Find high-need items here: arlingtonfoodpantry.org/donate-food. You may also donate by check or cash noting that the funds are for AFP. Thanks for your generosity and thanks to Bryan Mau for delivering our items to the AFP. The next NEAT dinner at St. John’s Church (74 Pleasant St.) is Saturday, May 26, from 5pm-6pm. This dinner is a community dinner, open to all and free of charge. If you’d like to volunteer, look for an email to chat, or please speak to Kate Lindheim. Thanks! PACC provides a meal for about 25 people on the fourth Monday of every month. Look for an email to CHAT or speak to Kate Lindheim if you’d like to prepare dinner, provide food, and help set up, plate food, serve food, or clean up. The Boston Pride Parade is Saturday, June 9. Please speak to Jill Lewis or Mike Rich if you think you might be going, or if you have any questions. Keynote Speaker: Rev. Liz Walker. “Her remarks will address the Moral Courage for Public Policy: What does this mean? Why do communities need to be a part of shaping public policy? What areas do they want involvement in? What are some examples in communities already? How do WE participate in society? It will be a night of music, community awards, and a great way to meet people across our different constituencies.” Talk to Jill Lewis or Mike Rich or see www.eventbrite.com/e/cmm-anniversary-fundraising-dinner-2018-with-rev-liz-walker-tickets-42924307760. Because of PACC’s support of One Can Help, an organization that supports low-income, high-risk children and parents involved in the juvenile court system in Massachusetts, we have been given 2 free tickets to their annual celebration and fundraising dinner – Thursday, May 10, 2018 from 6:30-9:00 pm at The Windsor Club, Newton; Keynote Speaker Ayanna Pressley, Boston City Councilor. Talk to Mike Rich for more information. In the wake of the shooting deaths of Stefon Clark and Saheed Vassell, the Council of Deacons voted to put the Black Lives Matter banner up through the end of May. Currently it is secured to trees on the Park Ave. side of the building; it will go in the traditional banner space on the Paul Revere Rd. side of the building after the Rummage Sale banner comes down. Learn about the Mass. Conference UCC’s commitment to the Open and Affirming – ONA movement here: www.macucc.org/lgbt. Read PACC’s ONA Covenant here: www.pacc-ucc.org/home/about-us/open-and-affirming. Join us as we celebrate the 11th Anniversary of becoming an Open and Affirming Congregation during worship and in Coffee Hour on May 6. Wear a nametag with your pronouns. As we move into warmer weather, we are also moving through Eastertide. In worship we’ll continue to focus on stories of Jesus’ post-resurrection appearances and how we are challenged as people of faith to live like God is indeed with us, like Love is indeed stronger than death. Eastertide ends on May 20th with Pentecost. From the Greek word for “fifty days,” Pentecost falls on the 50th day of the Easter season and marks the receiving of the Holy Spirit by Jesus’ disciples and a whole crowd of followers. It’s also traditionally considered the birthday of the Church, when the reins were handed over to the disciples to start living and sharing the Good News themselves. In other words, Pentecost is a time to think about how we claim a mature faith for ourselves – a faith we are committed to wrestling with, a faith journey we are willing to invite others to share with us, a faith exploration that with all its questions and complexities keeps our church community vibrant and alive. The good news is that we aren’t left to do it on our own; we have the Holy Spirit, origin of those holy nudges and moments of fresh perspective that help us to live out our faith, reaching out to those around us in a spirit of love, joy, and adventure.